The topic of this blog post is the danger of energy drinks. At Dr. Wesley Yemoto DDS in San Jose, we are sounding the alarm: energy drinks can damage tooth enamel and wreck an otherwise perfect smile. Most of our patients take good care of their teeth. They brush and floss, and see us for a twice-yearly exams and cleanings. But guess what? If you drink energy drinks regularly, your enamel can erode even if you practice immaculate oral hygiene. We’ve all seen them on grocery store shelves, and in the hands of teens and adults. 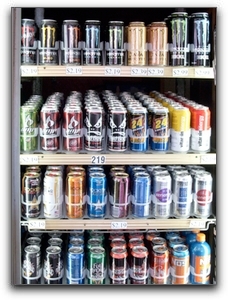 Energy drinks like Red Bull, Rock Star, and Monster are a cocktail of powerful acids and other enamel-eroding substances. Most of them contain citric acid, fruit juices, loads of sugar, and a potent chemical that gives them their bright fluorescent color. Soda and fruit juices also contain acids that can damage teeth. If your teeth have enamel erosion, whatever the cause, we can restore your smile with advanced cosmetic dentistry. If you are interested in designing a perfect smile, come in to Dr. Wesley Yemoto DDS for an exam and consultation. Visit our smile gallery to see examples of what we can do. We provide general and restorative dentistry.